With Q4 upon us, it’s imperative that you have a funding solution in place to make the most of 2018 ad budgets. Having a partner like OAREX can be the difference between 400% ad revenue growth and the same old story of no growth. In fact I would argue that having a cash-flow solution in place is a necessary component to your overall growth plan. Given another solution in the marketplace is available we thought we’d provide a direct comparison of “us vs. them”. 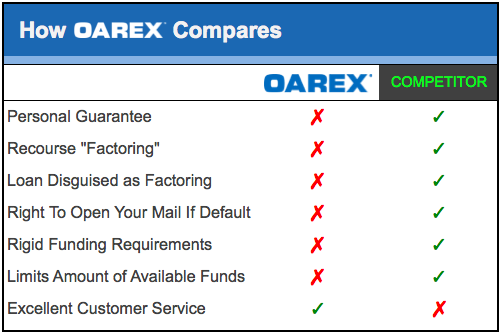 Unlike others, OAREX does not have the right to open your mail if customers don’t pay. So how are we different: well the main difference is that we are who we say we are (more on this later), but here is a breakdown. 1. We are not a lender, so you will not be subject to the lender-borrow dynamic. Our competitor offers loans and holds themselves out as a lender, so you will be subject to the superior-inferior relationship. OAREX is a true factoring firm, meaning we take collection risk that your customers don’t pay. We do not lend money to your business, and expect repayment from your company. We expect payment from your customers, who become our “debtors” after we buy your invoices. Our funding solution mechanically works like a line of credit, but legally it does not: you are not liable if customers don’t pay, and therefore not subject to a “crackdown” on your business the way a lender would. With OAREX, you will be free of that uncomfortable lender-borrower dynamic. 2. We do not cap your credit, so OAREX will grow with you as you need it. Our competitor limits the funds made available to you when you need them the most, hindering your growth. Since OAREX is not a lender, we do not take credit risk in your business (we only take credit risk in your customers’ businesses). You could have a 450 FICO with zero credit history on your business and we’ll still fund you. And since we don’t care about your credit, we will not limit the amount of money made available to your business. The only limit is the “advance amount”, which is the % of money you can receive for each invoice. Currently, the max advance limit is 90% of your invoice value. 3. We do not require a personal guarantee, so if things go South we won’t take your personal assets. Our competitor requires a personal guarantee, despite having claims against your business and business assets. If things go South for you and your business, rest assured OAREX will not come after you personally*. Our competitor has a different philosophy about that. 4. If your customer doesn’t pay, you are not liable to make good with OAREX. Our competitor offers recourse factoring products, so if your customers don’t pay, you are still liable. 5. We are who we say we are. Many “factoring” companies hold themselves out as factoring companies. This means that they claim to buy invoices. If a company buys an invoice from another company, they should be taking all collection risk (in theory). However many don’t (see point #4 above). The fact that some factoring companies — including our competitor — offer “recourse factoring” turns the true factoring product into a loan. Think of it this way: if we claim to “buy” your invoices, then we should be stepping into your shoes in the way of risk, collection, etc. Right? That is what factors do. However, if we hold ourselves out as a factor, but we’re not willing to assume the risks that come with owning the invoices — because we can come after you in the event of non-payment — then what are we offering? We are offering a line of credit against your basket of invoices, which is a loan. This is deceptive. Many people sign up with factoring firms thinking they are receiving factoring, but they’re really becoming a borrower (oftentimes against their own knowing, for lack of legal knowledge). This is deceptive and calls into question the legal theory of “substance over form” — it doesn’t matter what you call it: if it looks like a duck, walks like a duck and talks like a duck, then it is a duck. It doesn’t matter if you call a loan factoring: if you are liable for non-payment, then you are a borrower, and all the ramifications of being a borrower follow. So to my first and most important point of how we are different: we are who we say we are. OAREX is a factoring firm, and we’re not going to disguise a loan to customers by calling it factoring. This article was written by Hanna Kassis, the Founder & CEO of OAREX Capital Markets. Hanna can be reached at hanna [at] oarex [dot] com. *OAREX clients are always liable in the event of fraud. OAREX is a worldwide leader in providing fast, flexible funding for digital media companies. We provide funding for viral publishers, smart phone app developers/publishers, SSPs/DSPs/Exchanges and ad agencies. We’re backed by Arena Investors, LP, a $1B global investment firm based in NYC. We are located in the historical district of Cleveland’s Tremont neighborhood and the Meatpacking District in NYC. Copyright © 2017. OAREX Capital Markets, Inc. ENTER YOUR EMAIL TO VIEW THE RESULTS.